History: From its introduction to U.S. Naval service in 1936, through its continued international military use into the 1970's, to the recent retirement of the last civilian fire-bomber, the Consolidated PBY Catalina has served a distinguished career as one of the most rugged and versatile aircraft in U.S. history. It was created in response to the U.S. Navy's 1933 request for a prototype to replace the Consolidated P2Y and the Martin P3M with a new patrol-bomber flying boat with extended range and greater load capacity. The Catalina was created under the guidance of the brilliant aero-engineer Isaac Macklin Laddon. The new design introduced internal wing bracing, which greatly reduced the need for drag-producing struts and bracing wires. A significant improvement over its predecessors, it had a range of 2,545 miles, and a maximum take-off weight of 35,420 lbs. In 1939 the Navy considered discontinuing its use in favor of proposed replacements. The Catalina remained in production, however, because of massive orders placed by Britain, Canada, Australia, France, and the Netherlands. These countries desperately needed reliable patrol planes in their eleventh-hour preparations for WW II. Far from replacing the PBY, the Navy placed its largest single order since WW I for an aircraft. Over the years, numerous improvements were made to the design, and many variants were produced under license by several different companies. An amphibious version, the PBY-5A, was developed in 1939, through the addition of a retractable tricycle undercarriage. The PBY-6A featured hydrodynamic improvements designed by the Naval Aircraft Factory. The Soviet Union produced a license-built version for their Navy called the GST and powered by Mikulin M-62 radial engines. Boeing Aircraft of Canada built the PB2B-1 and PB2B-2 ("Canso"), and a derivative of the PBY-5A called the PBV-1A was built by Canadian Vickers. In US Army Air Force service, the aircraft was known as the OA-10A (PBY-5A) and OA-10B (PBY-6A). The Royal Air Force's Coastal Command flew Catalinas under the designations Catalina Mk I/II/III/IV. The Naval Aircraft Factory built a similar-looking version called the PBN-1 Nomad that can rightly be called a different aircraft, so extensive were the changes. A total of approximately 4000 Catalinas and variants were built between 1936 and 1945. Because of their worldwide popularity, there was scarcely a maritime battle in WW II in which they were not involved. The PBY had its vulnerabilities: it was slow, with a maximum speed of 179 mph, and with no crew armor or self-sealing tanks, it was highly vulnerable to anti-aircraft attack. However it was these weaknesses, coincident with the development of effective radar, and Japanese reliance on night transport, which led to the development of the "Black Cat Squadrons." These crews performed nighttime search and attack missions in their black-painted PBYs. The tactics were spectacularly successful and seriously disrupted the flow of supplies and personnel to Japanese island bases. The Catalinas also proved effective in search and rescue missions, code-named "Dumbo." Small detachments (normally of three PBYs) routinely orbited on stand-by near targeted combat areas. One detachment based in the Solomon islands rescued 161 airmen between January 1 and August 15, 1943, and successes increased steadily as equipment and tactics improved. After WWII, the PBY continued its search and rescue service in many Central and South American countries, as well as in Denmark, until the 1970's. The Catalina has also proved useful in civilian service: in scheduled passenger flights in Alaska and the Caribbean, in geophysical survey, and mostly, in fire-bombing for the U.S. Forest Service until the retirement of the last PBY in the early 1980s. 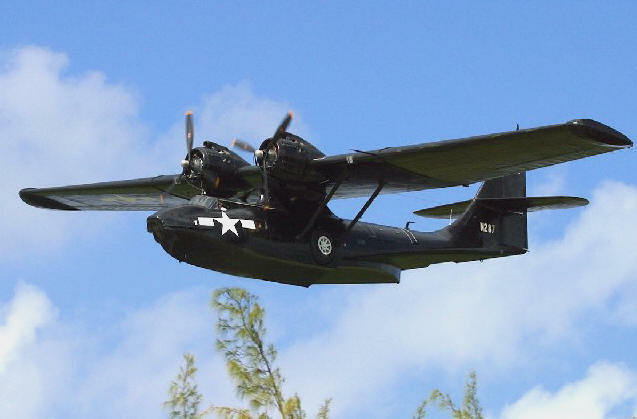 Through its long and varied service, the Consolidated PBY Catalina and its numerous variants have earned their reputation as a workhorse of naval aviation. NIcknames: Cat; Mad Cat (When outfitted with Magnetic Anomaly Detection Gear); Black Cat (Night Variant); Pig Boat; P-Boat; Y-Boat (Dutch Navy nickname); Canso/Canso A (Canadian designation); Mop (NATO designation for Soviet Lend-Lease PBYs). Weight: Empty 20,910 lbs., Max Takeoff 35,420 lbs. PBY Catalina Pilot Report by J.B. Stokely.